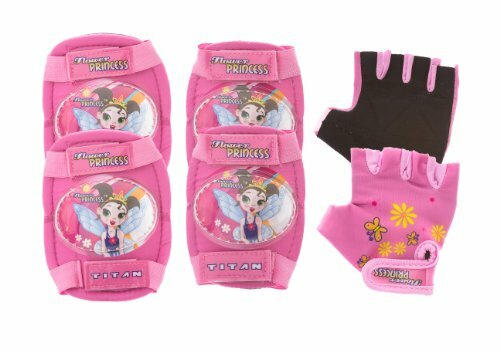 TITAN Flower Princess Multi-Sport Elbow & Knee Pads with Gloves. Arrives in plastic retail packaging with header card. The set includes 2 knee pads, 2 elbow pads and 2 gloves. Intended for girls ages 6-12. Matches the popular TITAN Flower Princess BMX Bike with Training Wheels and the TITAN Flower Princess Multi-Sport protective Helmet. This product comes with a 30 day warranty against defects. TITAN is a registered trademark of BIKE USA Inc. In the USA.